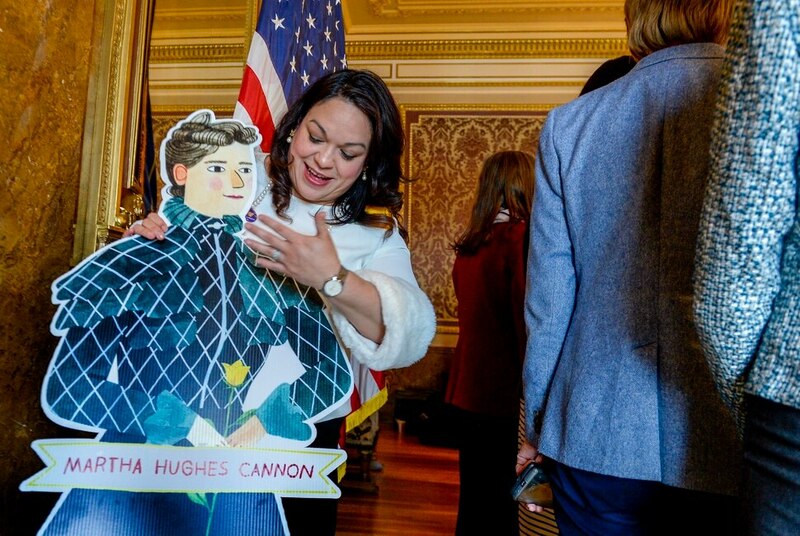 Leah Hogsten | The Salt Lake Tribune Luz Escamilla, D-Salt Lake City marvels at the cardboard statue of Martha Hughes Cannon — a polygamist, suffragette and doctor who was the first state senator in Utah and the country — drawn by Brooke Smart, a Bluffdale illustrator who created the portrait. Cannon will be place in the National Statuary Hall collection in Washington, D.C. in 2020 as the nation celebrates the 100th anniversary of the 19th Amendment and the 55th anniversary of the Voting Rights Act. 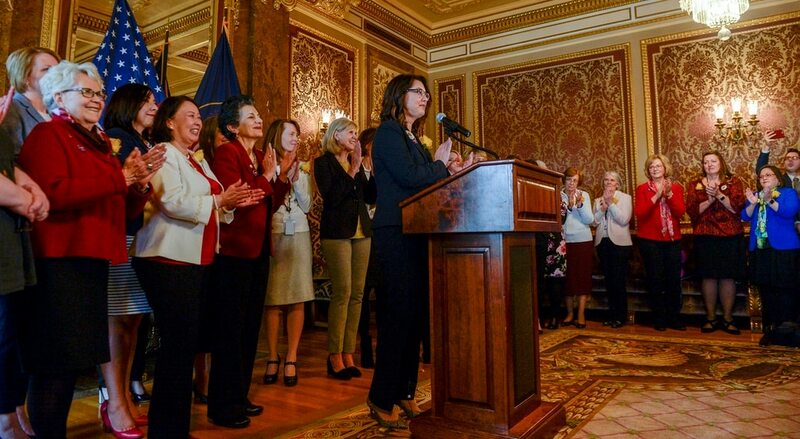 Leah Hogsten | The Salt Lake Tribune “Standing here together are the 25 women of the 63rd Legislature — a historic number for Utah,” said Sen. Deidre Henderson, R-Spanish Fork, Feb. 14, 2019. One hundred twenty-three years ago, Martha Hughes Cannon carved a path for us and women all over America to follow. We recognize that we are part of her legacy.” Henderson and fellow legislators commenorated women's suffrage. A statue of Martha Hughes Cannon — a polygamist, suffragette and doctor who was the first state senator in Utah and the country — will be place in the National Statuary Hall collection in Washington, D.C. in 2020 as the nation celebrates the 100th anniversary of the 19th Amendment and the 55th anniversary of the Voting Rights Act. Leah Hogsten | The Salt Lake Tribune “I’m just grateful to have this opportunity,” sculptor Ben Hammond said at unveiling at the Capitol on Thursday. “I promise the family to try to do my best to make it look beautiful, to make it look like Martha and to make something that the family is personally proud of, to represent a wonderful member of their family and [that] the state is proud to have stand in Statuary Hall to make a beautiful image of a wonderful Utahn.” A statue of Martha Hughes Cannon — a polygamist, suffragette and doctor who was the first state senator in Utah and the country — will be place in the National Statuary Hall collection in Washington, D.C. in 2020 as the nation celebrates the 100th anniversary of the 19th Amendment and the 55th anniversary of the Voting Rights Act. Leah Hogsten | The Salt Lake Tribune l-r Descendents of Martha Hughes Cannon, gr-gr-grandson Blaine Brady, gr-gr-grandaughter Arlene Woodbury and her husband Mark Woodbury shed tears of joy during the ceremony to announce that artist Ben Hammond of American Fork will be sculpting their gr-gr-grandmother. Martha Hughes Cannon — a polygamist, suffragette and doctor who was the first state senator in Utah and the country — will be place in the National Statuary Hall collection in Washington, D.C. in 2020 as the nation celebrates the 100th anniversary of the 19th Amendment and the 55th anniversary of the Voting Rights Act. Leah Hogsten | The Salt Lake Tribune Descendent of Martha Hughes Cannon, gr-gr-grandaughter Arlene Woodbury talks with artist Ben Hammond of American Fork, who will be sculpting her gr-gr-grandmother's likeness in bronze. Martha Hughes Cannon — a polygamist, suffragette and doctor who was the first state senator in Utah and the country — will be place in the National Statuary Hall collection in Washington, D.C. in 2020 as the nation celebrates the 100th anniversary of the 19th Amendment and the 55th anniversary of the Voting Rights Act. Leah Hogsten | The Salt Lake Tribune Blaine Brady, the oldest of Cannon’s great great grandsons, said after the announcement that he was “thrilled” to see the statue move closer to completion. He remembers Cannon’s daughter, his grandmother, telling stories about her mother and said he thinks she would be pleased, as well. Martha Hughes Cannon — a polygamist, suffragette and doctor who was the first state senator in Utah and the country — will be place in the National Statuary Hall collection in Washington, D.C. in 2020 as the nation celebrates the 100th anniversary of the 19th Amendment and the 55th anniversary of the Voting Rights Act. Leah Hogsten | The Salt Lake Tribune Becca Olea, with the Women's State Legislative Council of Utah, hands out political buttons, a symbol of women’s suffrage to Carol Moss, D-Holladay and her intern Samantha Frazier. Martha Hughes Cannon — a polygamist, suffragette and doctor who was the first state senator in Utah and the country — will be place in the National Statuary Hall collection in Washington, D.C. in 2020 as the nation celebrates the 100th anniversary of the 19th Amendment and the 55th anniversary of the Voting Rights Act. 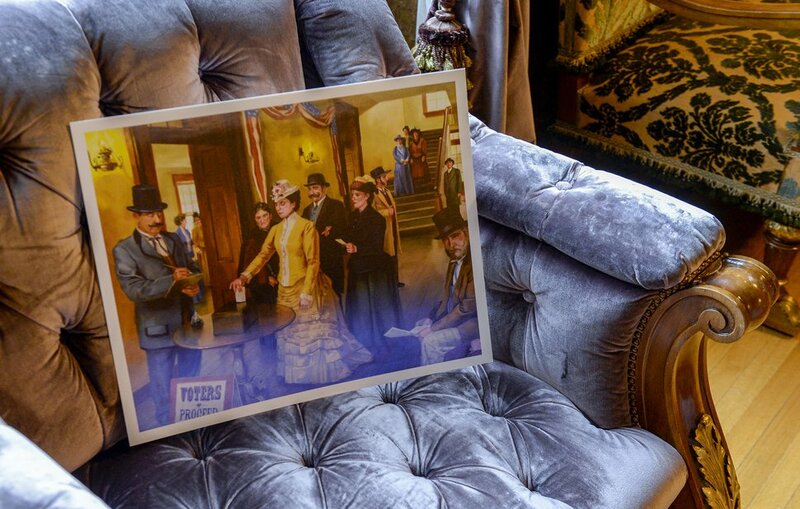 Leah Hogsten | The Salt Lake Tribune A photo of Seraph Young, casting her vote in a state-wide election on February 14, 1870, fifty years before the 19th Amendment was ratified, sits in a chair in the Capitol's Gold Room. Martha Hughes Cannon — a polygamist, suffragette and doctor who was the first state senator in Utah and the country — will be place in the National Statuary Hall collection in Washington, D.C. in 2020 as the nation celebrates the 100th anniversary of the 19th Amendment and the 55th anniversary of the Voting Rights Act. Leah Hogsten | The Salt Lake Tribune Rebecca Edwards, R-North Salt Lake thanks l-r Reese Tanner, Maya Mercer and Raquel Tanner, Girl Scouts with Troop 914 of Bountiful for attending the 149th First to Vote ceremony, Feb. 14, 2019 in the Capitol Gold Room. Martha Hughes Cannon — a polygamist, suffragette and doctor who was the first state senator in Utah and the country — will be place in the National Statuary Hall collection in Washington, D.C. in 2020 as the nation celebrates the 100th anniversary of the 19th Amendment and the 55th anniversary of the Voting Rights Act. 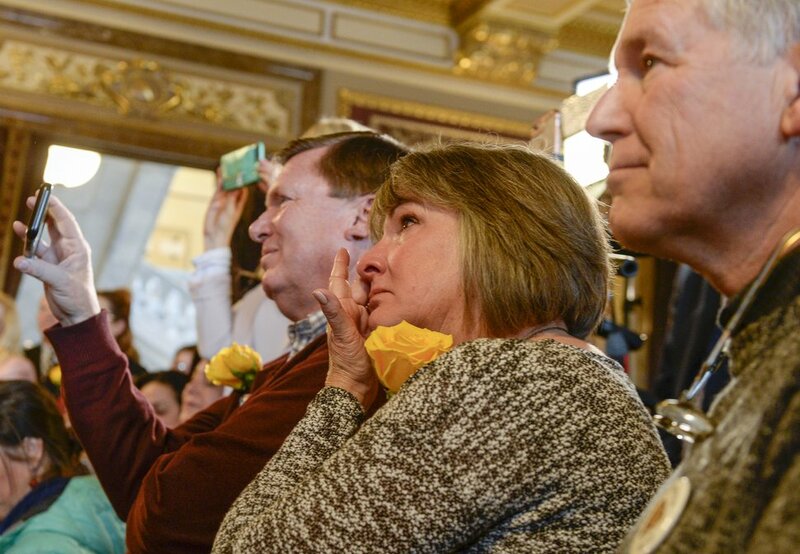 Leah Hogsten | The Salt Lake Tribune Yellow roses, a symbol of women’s suffrage, were handed out during the ceremony to commemorate the occasion. Martha Hughes Cannon — a polygamist, suffragette and doctor who was the first state senator in Utah and the country — will be place in the National Statuary Hall collection in Washington, D.C. in 2020 as the nation celebrates the 100th anniversary of the 19th Amendment and the 55th anniversary of the Voting Rights Act. Leah Hogsten | The Salt Lake Tribune In an effort to address the imbalance in recognition of women’s contributions to history, the Utah Legislature voted last year to send Martha Hughes Cannon — a polygamist, suffragette and doctor who was the first state senator in Utah and the country — to represent the state in the National Statuary Hall collection in Washington, D.C. Feb. 14, 2019. Leah Hogsten | The Salt Lake Tribune Standing here together are the 25 women of the 63rd Legislature, a historic number for Utah, said Sen. Deidre Henderson, R-Spanish Fork, Feb. 14, 2019. One hundred twenty-three years ago, Martha Hughes Cannon carved a path for us and women all over America to follow. We recognize that we are part of her legacy. Henderson and fellow legislators commenorated women's suffrage. A statue of Martha Hughes Cannon-- a polygamist, suffragette and doctor who was the first state senator in Utah and the country-- will be place in the National Statuary Hall collection in Washington, D.C. in 2020 as the nation celebrates the 100th anniversary of the 19th Amendment and the 55th anniversary of the Voting Rights Act. There are nine statues of women in the National Statuary Hall collection in Washington, D.C., where two figures of historic significance represent each state. There are 13 statues of men named John — 14, if you count Connecticut’s carving of Jonathan Trumbull, the only man who served as governor in both an English colony and a U.S. state. In an effort to address the imbalance in recognition of women’s contributions to history, the Utah Legislature voted last year to send Martha Hughes Cannon — a polygamist, suffragist and doctor who was the first female state senator in Utah and the country — to represent the state in Statuary Hall. 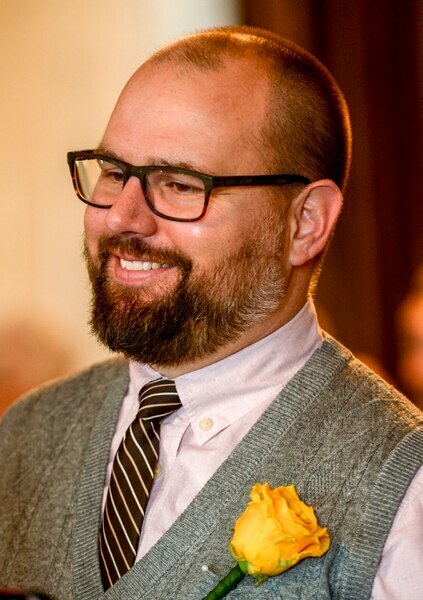 And on Thursday, a state committee took its next step in getting her there with the announcement that artist Ben Hammond, of American Fork, will sculpt her statue. Cannon’s bronze statue, which will be funded through private donations and support, is expected to arrive in the Capitol next August to mark the 100th anniversary of the 19th Amendment. She will replace television inventor Philo T. Farnsworth. Utah’s other monument is of Mormon pioneer leader Brigham Young. Leah Hogsten | The Salt Lake Tribune A photo of Seraph Young, casting her vote in a state-wide election on February 14, 1870, fifty years before the 19th Amendment was ratified, sits in a chair in the Capitol's Gold Room. Martha Hughes Cannon — a polygamist, suffragette and doctor who was the first state senator in Utah and the country — will be place in the National Statuary Hall collection in Washington, D.C. in 2020 as the nation celebrates the 100th anniversary of the 19th Amendment and the 55th anniversary of the Voting Rights Act. Cannon’s descendants and past and present female legislators looked on during the announcement, which came exactly 149 years after Seraph Young became the first woman to vote not only in Utah but in all of America. Many wore yellow roses, a symbol of women’s suffrage, to commemorate the occasion. Over the last 122 years, fewer than 30 other women have followed Cannon into the Utah Senate. And today, Utah routinely ranks at or near the bottom of national equality rankings, based on the low representation of women in government, the state’s pay gap and other factors. A recent index of sexist attitudes found Utah is the second-most sexist state in the nation. Blaine Brady, the oldest of Cannon’s great great grandsons, said after the announcement that he was “thrilled” to see the statue move closer to completion. He remembers Cannon’s daughter, his grandmother, telling stories about her mother and said he thinks she would be pleased, as well. Leah Hogsten | The Salt Lake Tribune l-r Descendents of Martha Hughes Cannon, gr-gr-grandson Blaine Brady, gr-gr-grandaughter Arlene Woodbury and her husband Mark Woodbury shed tears of joy during the ceremony to announce that artist Ben Hammond of American Fork will be sculpting their gr-gr-grandmother. Martha Hughes Cannon — a polygamist, suffragette and doctor who was the first state senator in Utah and the country — will be place in the National Statuary Hall collection in Washington, D.C. in 2020 as the nation celebrates the 100th anniversary of the 19th Amendment and the 55th anniversary of the Voting Rights Act. The oversight committee received 25 applications from artists interested in sculpting Cannon’s statute and interviewed its top five finalists earlier this month: Utahns Hammond, Edward J. Fraughton and Dennis Smith; Jane DeDecker, of Colorado, and Dora Natella, of Indiana. Each was asked to create a small preliminary model or sketch. Leah Hogsten | The Salt Lake Tribune “I’m just grateful to have this opportunity,” sculptor Ben Hammond said at unveiling at the Capitol on Thursday. “I promise the family to try to do my best to make it look beautiful, to make it look like Martha and to make something that the family is personally proud of, to represent a wonderful member of their family and [that] the state is proud to have stand in Statuary Hall to make a beautiful image of a wonderful Utahn.” A statue of Martha Hughes Cannon — a polygamist, suffragette and doctor who was the first state senator in Utah and the country — will be place in the National Statuary Hall collection in Washington, D.C. in 2020 as the nation celebrates the 100th anniversary of the 19th Amendment and the 55th anniversary of the Voting Rights Act. Hammond’s sculptures are displayed throughout the country and the Idaho native has received multiple awards for his work, including the bronze medal at the National Sculpture Society’s Annual Awards Exhibition in 2013. The collection of state statues in the U.S. Capitol includes only nine women: Helen Keller, the first deaf-blind person to earn a college degree, from Alabama; Mother Joseph, a humanitarian missionary from Washington; Esther Hobart Morris, a Wyoming “suffragist"; Jeannette Rankin, Montana, the first female member of Congress; Florence Sabin, a public health pioneer from Colorado; Sacagawea, North Dakota, a guide for the Lewis and Clark expedition; Maria Sanford, a Minnesota educator; Frances Willard, Illinois, a temperance-movement activist; and Sarah Winnemucca, Nevada, who helped save her Piute tribe.